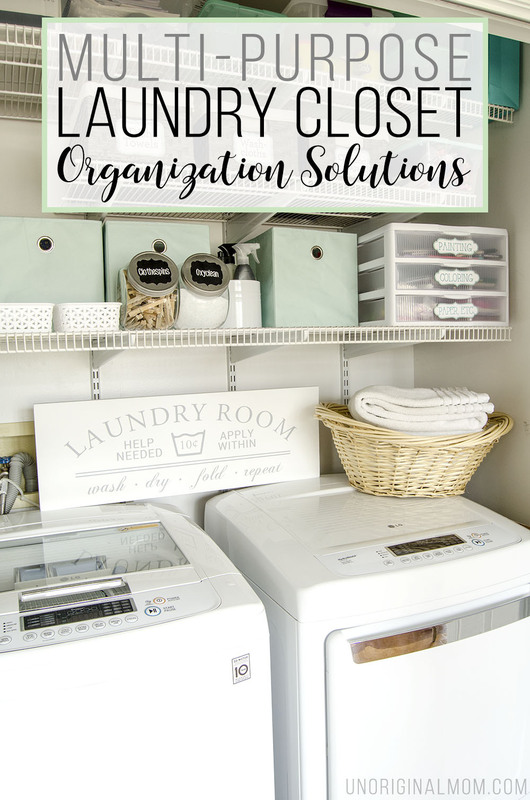 I’ve been talking a lot lately about organization and clutter solutions and the goals I have for getting organized, so I figured it was time to show you I’m not just all talk ;-) I’m sharing a fun before-and-after of our laundry closet organization today, and a few ideas for multi-purpose laundry closet organization solutions! A theme in my life lately has been paralyzation-by-perfectionism. I’ve always had perfectionist tendances, but I didn’t realize until recently how much they were holding me back around our home. A few months ago, I opened up about how it has affected my home decor choices and motivations and I’m happy to say that I feel like I’ve been moving forward in leaps and bounds by actually identifying my style preferences, making plans, and moving forward with some decor decisions and actions. Now, it’s still a slow process because…well, life. But we’re making progress, at least! Oh gosh, you guys, I am definitely embarrassed to admit that was a closet in my house, let alone to publish that picture. Yikes. 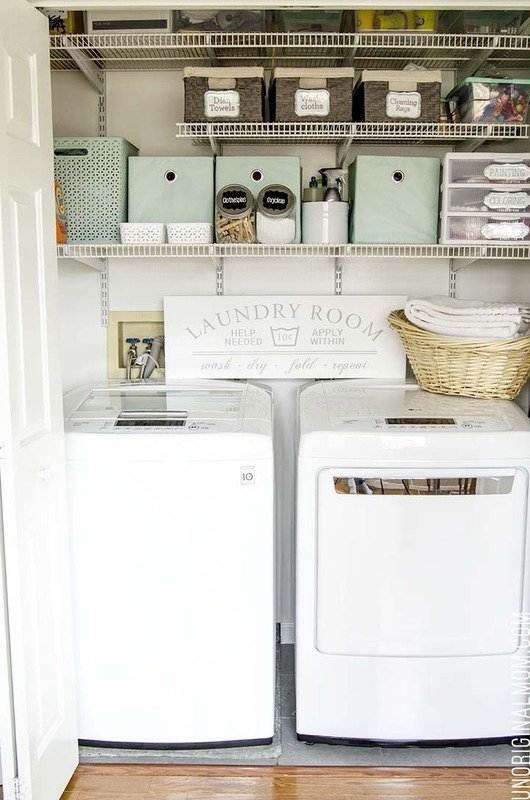 Let me start by telling you a little bit about our multi-purpose laundry closet space. It is RIGHT off of our kitchen/living room area. Like, just a few feet away from the table where we eat all our meals. On one hand, it’s nice because I don’t have to carry the laundry all the way to the basement, and I don’t forget to switch loads. (Okay, I still forget to switch loads about half of the time. 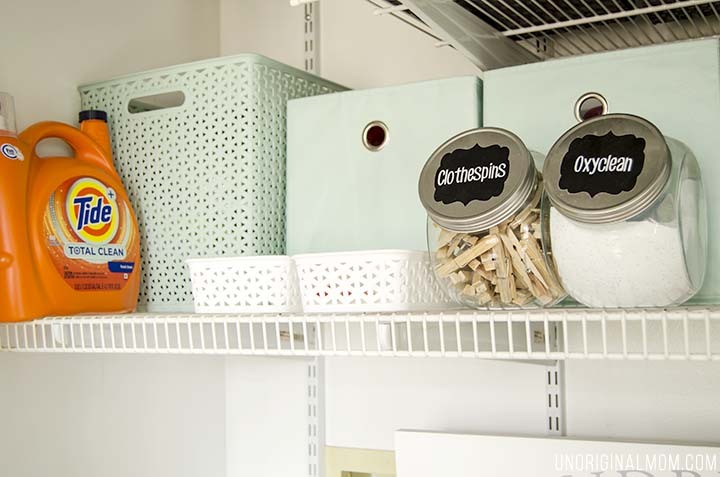 #mentalblock) But I also really hate having the laundry where it is – there’s nowhere to store larger laundry items (baskets, ironing board, etc. ), nowhere to line dry our sweaters and things, and it’s noisy. 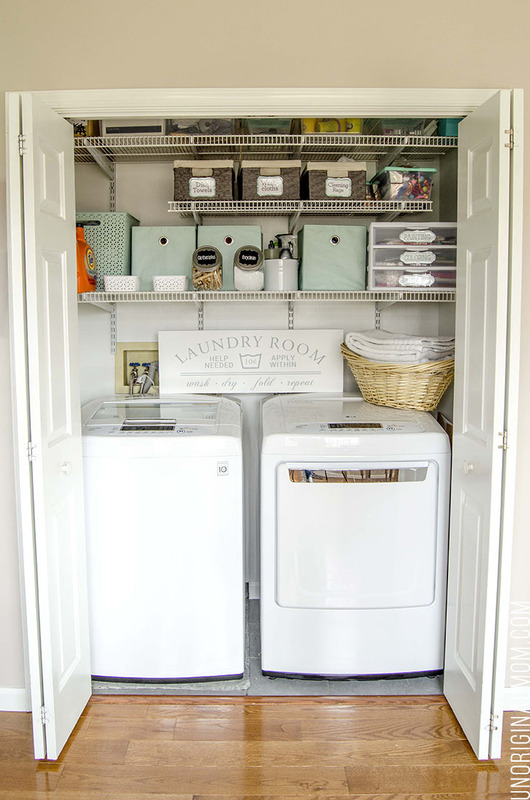 Plus, since this close is right off of our living area, it has become more of a multi-purpose closet instead of just a laundry closet, storing our dish towels, cleaning supplies, kid’s art supplies, and even our appliance manuals and old paint chips. 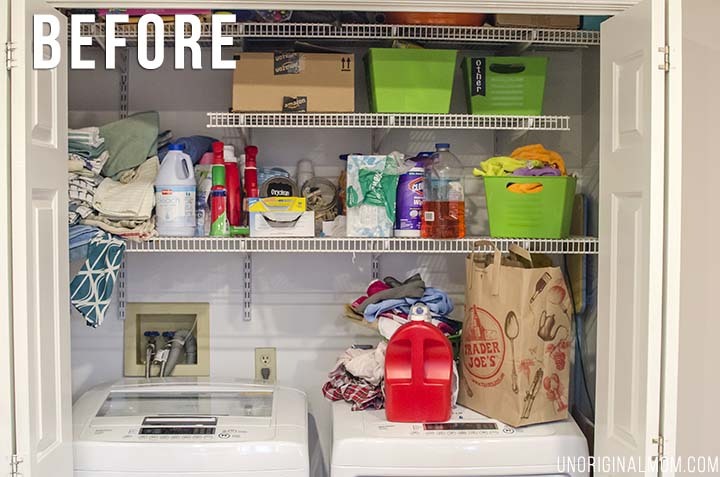 It’s no wonder this closet got to be such a mess! After I had all my storage containers, I took EVERYTHING out of the closet, put it all inside some kind of bin, basket, or drawer, and then put it back. 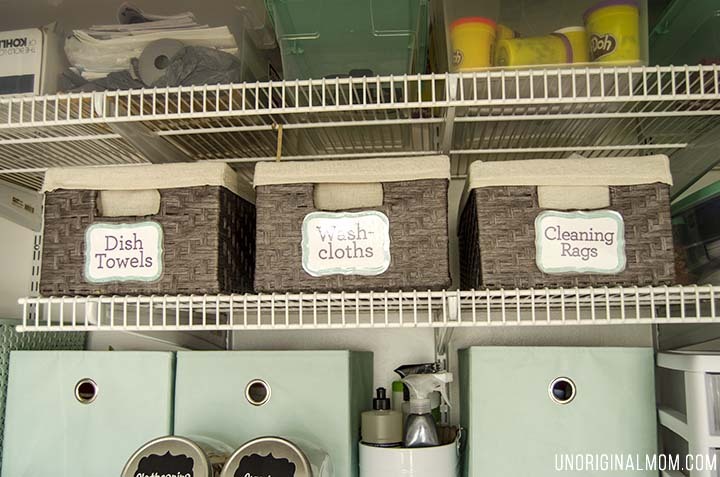 The fabric bins hold a lot of miscellaneous laundry and cleaning supplies – stain removers, lingerie bag, my Norwex detergent, Woolite, bleach, extra dryer sheets, etc. The large plastic mint basket is full of old towels – easy to grab to wipe off the dog’s muddy paws or clean up a big spill. I have my dryer sheets in one white basket (though I rarely use them anymore, I got these wool dryer balls about 6 months ago and love them!) and color catchers in the other. 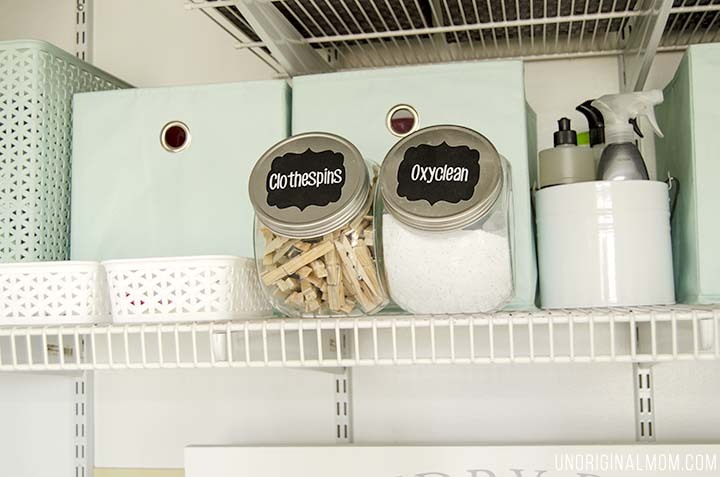 The glass jars hold clothespins and Oxyclean, and the cleaning caddy has a few of my everyday cleaning items so I can grab it and go clean around the house. 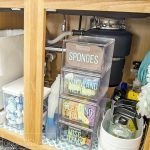 These plastic drawers are the least “pretty” storage solution, but they have been the most functional! They hold all my daughter’s coloring and painting supplies – she frequently wants to sit and color or paint at the kitchen table, so it’s easy for me to grab what she needs and get her set up there. Before they were just kind of haphazardly stashed on a shelf and the paint brushes and markers would frequently fall down through the wire shelves, and I’d have to fish them out from between the washer and dryer…yeah, not fun. This has been so much easier! On the second shelf, I have 3 long and narrow baskets that are a terrific use of space on these deep shelves. They’re holding our matching dish towel sets, washcloths for the sink, and various rags and microfiber cloths for cleaning. There’s plenty of height in the closet, but the door is just about even with the top shelf so things up there have to be tilted to get them out. That didn’t used to be very functional, as things were stacked precariously and difficult to get down without standing on a chair. But now, I put everything up there in bins with lids so I can reach up and tilt them down without anything falling out. No more Play Doh containers falling on my head! #2) Empty Space. I have a fair amount of extra space and even a few empty bins. One of those fabric bins is almost completely empty, and I have a few extra small clear bins on the top shelf. That way, as we accumulate more stuff or find other things I’d like to store in this closet, I’ll have a place to put it. 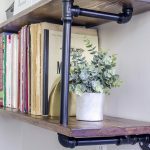 I’m so pleased that our final result here is both pretty AND functional. In case you’re wondering, this IS how this closet looks on a daily basis! In the interest of full disclosure, here’s what I took out of the closet to make it just a bit prettier for the photos: a dirty towel we use to wipe off the dog’s feet, usually that’s hanging on a hook inside the left side of the closet; a second container of laundry detergent that’s almost empty; and a folded up paper bag that was sitting on top of the art drawers that I lay out on the kitchen table when my daughter is painting. That’s it! This really is a REAL life organizing solution for our family. White Cleaning Caddy – Grove Co.
And here’s the before and after side by side, just for a bit more emphasis…what a transformation! 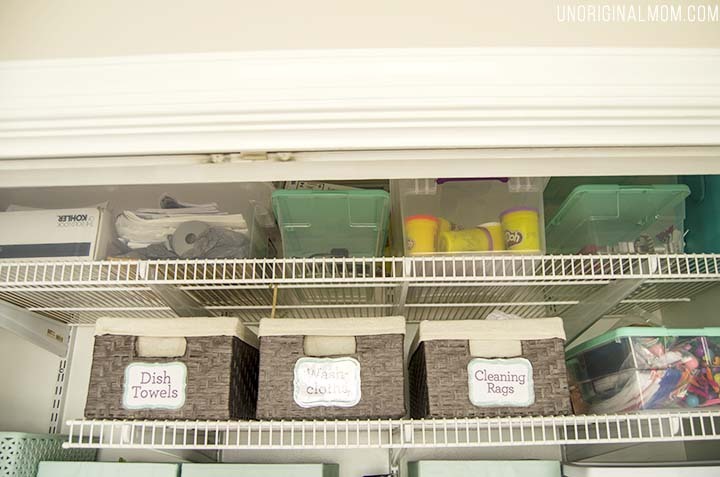 Do you have any tips for organizing multi-purpose storage spaces like this? 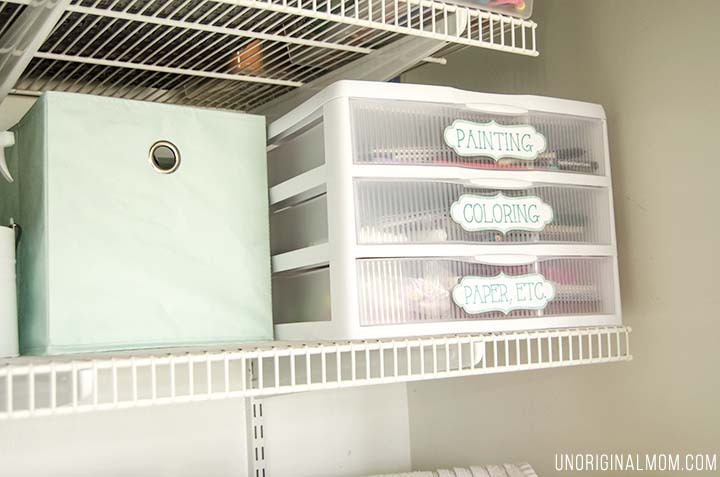 Or other ideas for laundry closet organization? I’m always looking for more tips and ideas! You did a very good job here, congrats! The space is so limited, and you still managed to fit everything and organise it perfectly! 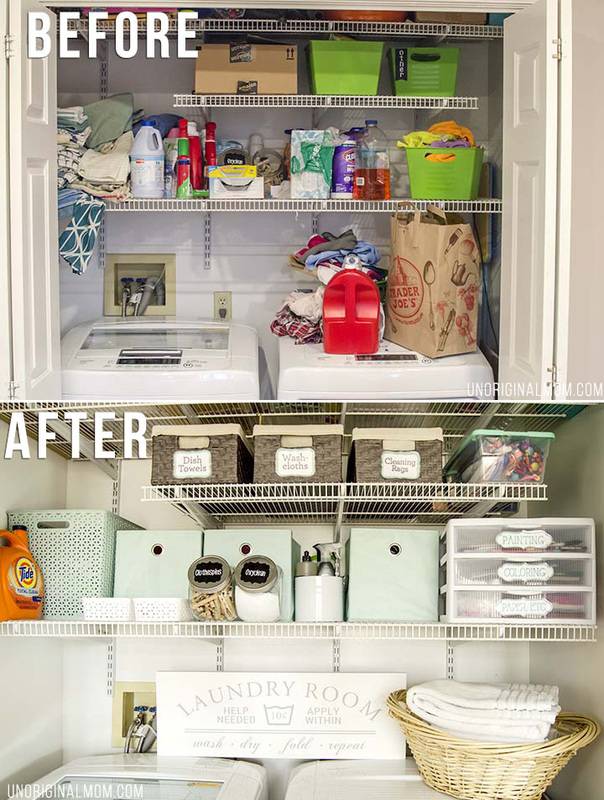 I love how you managed to put everything in a few boxes and the place suddenly turned from a small mess into a perfectly organised laundry room. How did you grow up in our house? My goodness! 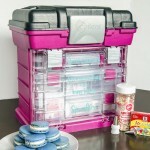 You put nearly every other laundry to shame with your organization. It’s one room of the house we avoid pretty often but that’s no excuse to have it looking messy! You’ve inspired me to get on top of it so thanks. This is so nice. You have managed everything in that little space and looking pretty. Hello, I love your closet! What is the depth of your closet? Thanks Michelle! The shelves are 21″ deep and the entire closet is about 32″ deep. 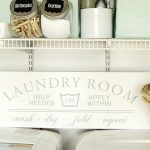 Your laundry closet looks amazing!! I am definitely going to run with many of your ideas. I have a laundry room but it is usually a disaster. 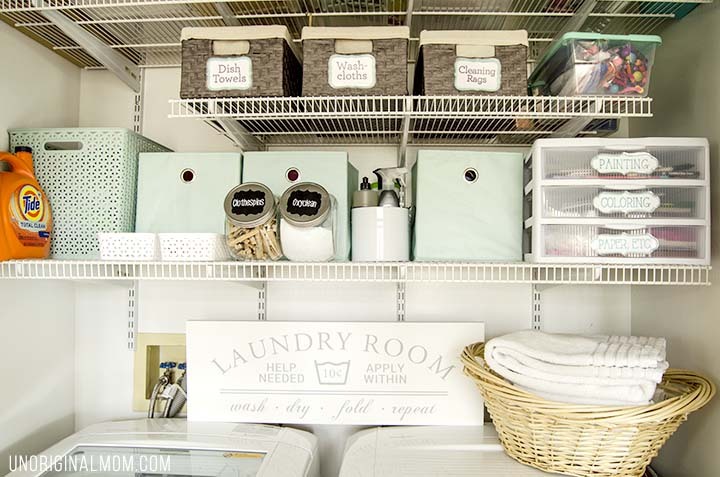 I can hardly wait to get some bins, baskets and organizers so I, too, can have an organized laundry area. Thanks to all the great tips!!! What do you have on the floor under your washer and dryer? There’s nothing under the dryer but there’s a metal drip tray thingy under the washer…it was there when we moved in.